For the first time in history, all the wondrous health benefits of Marine Phytoplankton, the source of ALL life in the oceans and land, are now readily available to man! No more do you have to guess and experiment trying to find out what you are nutrient deficient so you can restore your health and immune function to normal. Just add these marine phytoplankton everyday to your diet, and let the bodies innate intelligence use this complete superfood to heal itself. Scientists at NASA theorize that some 3 1/2 billion years ago, the world was changed forever. 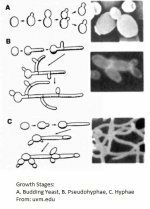 The appearance of tiny microscopic organisms with the ability to convert sunlight, warmth, water, and minerals into protein, carbohydrates, vitamins and amino acids marked the beginning of life. These single celled plant forms are the vegetation of the oceans and the bottom of the food chain. They also are responsible for 90% of the worlds oxygen which makes life out of the oceans possible. Phytoplankton are the food utilized by the world's largest and longest living animals and fish. 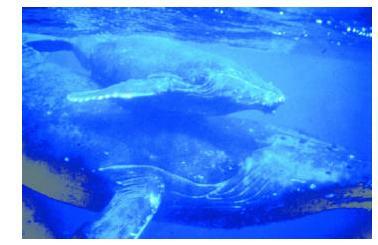 Blue whales, bowhead whales, baleen whales, gray whales, humpbacks, and right whales all eat plankton. These species live between 80 and 150 years old and maintain great strength and endurance throughout their lives. The largest fish, a plankton eating whale shark, lives for over 150 years, grows up to 14 meters long, weights up to 15 tons, and is sexually active until it dies. Marine Phytoplankton, comprise hundreds of species of photosynthetic, unicellular organisms belonging to the Kingdom Protista. Temperate coastal waters, such as those along British Columbia (BC) Canada, are highly productive and support a diverse array of micro algae species from numerous Classes, including the primary producers called diatoms (Class Bacillariophyceae). Every spring, when conditions of light, nutrients, and mixing are optimal for growth, diatoms grow rapidly in the euphotic zone (upper 20 m). This event is known as the "spring bloom". During this period, many species take advantage of the enhanced conditions, but generally, three diatom genera are the most successful - Skeletonema, Thalassiosira, and Chaetoceros. It's almost hard to believe, but new NASA-funded research confirms an old theory that plankton can indirectly create clouds that block some of the Sun's harmful rays. The study was conducted by Dierdre Toole of the Woods Hole Oceanographic Institution (WHOI) and David Siegel of the University of California, Santa Barbara (UCSB). The study finds that in summer when the Sun beats down on the top layer of ocean where plankton live, harmful rays in the form of ultraviolet (UV) radiation bother the little plants. UV light also gives sunburn to humans. When plankton are bothered, or stressed by UV light, their chemistry takes over. 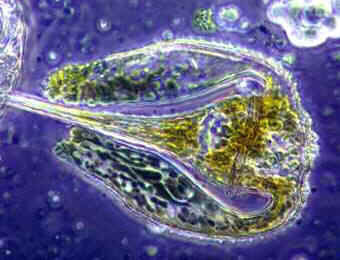 The plankton try to protect themselves by producing a chemical compound called DMSP, which some scientists believe helps strengthen the plankton's cell walls. This chemical gets broken down in the water by bacteria, and changes into another substance called DMS. DMS then filters from the ocean into the air, where it breaks down again to form tiny dust-like particles. These tiny particles are just the right size for water to condense on, which is the beginning of how clouds are formed. So, indirectly, plankton help create more clouds, and more clouds mean that less direct light reaches the ocean surface. This relieves the stress put on plankton by the Sun's harmful UV rays. Researchers found surprising evidence of sea salt and frozen plankton in high, cold, cirrus clouds, the remnants of Hurricane Nora, over the U.S. plains states. Although the 1997 hurricane was a strong eastern Pacific storm, her high ice-crystal clouds extended many miles inland, carrying ocean phenomena deep into the U.S. heartland. Kenneth Sassen of the University of Utah, Salt Lake City, and University of Alaska Fairbanks; W. Patrick Arnott of the Desert Research Institute (DRI) in Reno, Nev.; and David O. Starr of NASA's Goddard Space Flight Center, Greenbelt, Md., co-authored a paper about Hurricane Nora's far-reaching effects. The paper was published in the April 1, 2003, issue of the American Meteorological Society's Journal of Atmospheric Sciences. Scientists were surprised to find what appeared to be frozen plankton in some cirrus crystals collected by research aircraft over Oklahoma, far from the Pacific Ocean. This was the first time examples of microscopic marine life, like plankton, were seen as "nuclei" of ice crystals in the cirrus clouds of a hurricane. David Siegel, professor of geography at the University of California, Santa Barbara, and director of the Institute for Computational Earth System Science, made the discovery with his former Ph.D. student Dierdre Toole, who is now based at Woods Hole Oceanographic Institute. In an article in the May 6 issue of the journal Geophysical Research Letters, the scientists explain their research in the Sargasso Sea, approximately 50 miles southeast of the island of Bermuda. Siegel's research group has been making observations at this location since 1992. Phytoplankton are tiny, single-celled floating plants. They inhabit the upper layers of any natural body of water where there is enough light to support photosynthetic growth. They are the base of the ocean's food web, and their production helps to regulate the global carbon cycle. They also contribute to the global cycling of many other compounds with climate implications. One of these compounds is a volatile organic sulfur gas called dimethyl sulfide or DMS. Scientists had previously theorized that DMS is part of a climate feedback mechanism, but until now there had been no observational evidence illustrating how reduced sunlight actually leads to the decreased ocean production of DMS. This is the breakthrough in Toole and Siegel's research. They describe how the cycle begins when the ocean gives off DMS to the lower atmosphere. In the air, DMS breaks down into a variety of sulfur compounds that act as cloud-condensing nuclei, leading to increased cloudiness. With more clouds, less sunlight reaches the Earth and the biological processes which produce DMS are reduced. According to their research, it appears that phytoplankton produce organic sulfur compounds as a chemical defense from the damaging effects of ultraviolet radiation and other environmental stresses, in much the same way as our bodies use vitamins E and C to flush out molecules that cause cellular damage. Siegel and Toole found that ultraviolet radiation explained almost 90 percent of the variability in the biological production of DMS. They showed that summertime DMS production is "enormous," and that the entire upper layer of DMS content is replaced in just a few days. This demonstrates a tight link between DMS and solar fluxes. "The significance of this work is that it provides, for the first time, observational evidence showing that the DMS-anti-oxidant mechanism closes the DMS-climate feedback loop," said Siegel. "The implications are huge. 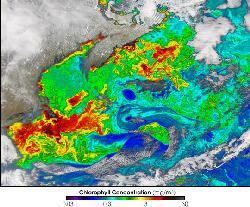 Now we know that phytoplankton respond dramatically to UV radiation stresses, and that this response is incredibly rapid, literally just days." Scientists analyzing satellite data on ocean color are gaining new insights into ocean productivity and climate. A green ocean is a productive ocean; the light from the sun fuels the "bloom" of phytoplankton, tiny ocean plants that turn the sea's surface a light green each spring. This production in turn drives ocean food webs. New research, published in the journal Science on April 26, assesses the color of the ocean and finds that it may yield clues about the relation between marine ecosystems and the climate system. The research was funded by the National Science Foundation (NSF). 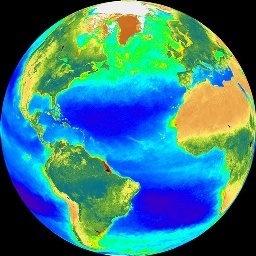 David Siegel, a scientist at the University of California, Santa Barbara, and colleagues analyzed ocean color data from the satellite Sea-viewing Wide Field of view Sensor (called "Sea WiFS") to address the factors regulating the spring bloom of phytoplankton in the north Atlantic Ocean. "The productivity of the ocean [from blooms] is well established," said Siegel. "What we don't know is how it gets recycled. We're trying to get at how the ocean's biological pump works." The biological pump is the mechanism by which carbon dioxide is exported from the surface ocean into the deep ocean via sinking particles, like the remains of phytoplankton as they die off after blooms. It is a critical factor in understanding global climate change. From the satellite is information Siegel and colleagues were able to deduce the conditions required to start a spring bloom: appropriate amounts of light reaching down into the water column, a condition that occurs when ocean waters "turn over" or mix, in spring. "When viewed from space, the north Atlantic spring bloom is among the largest mass greenings observed on the Earth's surface," said Siegel. The blooming progresses at speeds of 20 kilometers per day, leaving a green wake in its path. Jim Yoder, a co-author of the paper, on leave from the University of Rhode Island Graduate School of Oceanography and currently division director of ocean sciences at the National Science Foundation said, "We used satellite and other data to observe the start of the phytoplankton growth period in the north Atlantic Ocean, and we were able to explain the timing of the spring growth period in the entire north Atlantic." Previous research on spring blooms was done at sea with microscopes and other tools. But by using satellites, Siegel and Yoder were able to evaluate the process using tens of thousands of data points, rather than just a few. One advantage provided by satellite ocean color data is measurements that cover the entire north Atlantic during all seasons and years. Such measurements, if correctly interpreted, are a tool for studying natural phytoplankton variability - an important characteristic of marine ecosystems. The results of the present study illustrate an approach for using satellite measurements to study the year-to-year ecosystem variability associated with changes to the climate system and to the location and strength of ocean currents. Marine phytoplankton contains over 65 nutritional properties including all the amino acids, all the essential fats, all vitamins, key minerals and trace elements, rare anti-oxidants, phospholids, electrolytes, nucleic acids, enzymes and co-enzymes. It is a living food that carries electrical frequency and works with the intelligence of the body. It is believed that it is the combination and proportion of elements and nutrients that make marine phytoplankton unique and so effective in enabling cellular regeneration and therefore healing. The elements and electrolytes are almost tailor-made for the human body. We arose from the sea and our internal bodies reflect this with the composition of human plasma similar to that of seawater. Our bodies are over 70% water. Marine phytoplankton provides the perfect anti-dote in an age of over-reliance of land-based food sources and continuing mineral depletion in the soil and in our food which in turn leads to deficiencies of micro-nutrients and trace elements in our bodies. In addition to overcoming mineral depletion, it also works to balance the body’s PH with a PH of 8-8.5. Marine phytoplankton also considerably increases the amount of oxygen that the body can carry. This is crucial for a healthy body and many people have reported that it has increased their athletic endurance and stamina due to increased oxygen levels in the blood. "This is the most exciting product I have come across. It contains almost everything necessary to sustain life and build healthy new cells. When you give the body everything it needs to produce trillions of healthy new cells then you get well." Dr. Tennant notes that many products work for some people but not others. He believes this is because the body needs all the raw materials and critical components at the same time. "The problem is that we need ALL of them at the same time for things to work." Another very important reason that makes marine phytoplankton unique and very effective is that is composed of single cells that bypass the liver and digestive system. This is highly significant and is one reason Dr. Tennant believes results have been seen so quickly, particularly with critical and chronically ill patients who have sick livers. Whereas other products took months to see significant results, results were being noticed within days of taking marine phytoplankton. It also contains a complete amino acid profile that supports the building and repair of cells. The phytonutrients found in marine phytoplankton exhibit potentially promising effects in human physiology. In short, with the harvesting of marine phytoplankton, we now have an exclusive, complete food source that can fulfill all our body's nutritional needs. Health professionals have termed it the "world's only complete food" and the most perfect food source now available. Until now, mankind could only dream of obtaining significant quantities of microscopic plants. Through years of research, the Sea Farms can now grow these in quantity. This state of the art facility allows us to produce something unique in the world for your benefit. Many manufactures call cyanobacteria algae. Our marine phytoplankton is not cyanobateria but true micro-algae in its many forms and species. This along with our processing makes our product totally unique in the world. During ancient times Frankincense was considered more valuable than gold. This milky white resin produced by a scrubby little tree, genus Boswellia, has been traded for over 5000 years. It is still regarded as a very valuable commodity, and it's pure essential oil sells for up to a dollar a drop. Some call it the "mother" of all essential oils. Frankincense has the ability to have a calming effect on the nervous system by crossing the blood brain barrier and is excellent for use with stress related conditions and anxiety. Astaxanthin is a powerful, natural, biological antioxidant extracted from the marine micro algae, Hae-matococcus pluvialis. Many carotenoids, such as astaxanthin, act as antioxidants to protect our cells from free radicals. Astaxanthin also crosses the blood brain barrier, making it available to the eyes, brain, and central nervous system to alleviate oxidative stresses that contribute to ocular and neurodegenerative diseases, such as glaucoma, macular degeneration or Parkinson's Disease. It may also destroy H.Pylori bacteria. Frequensea with Marine Phytoplankton also contains Aloe Vera, Cranberry Concentrate, Blueberry Concentrate, Sea Water, Purified Water (Rain), Bladderwrack, Spirulina, Irish Moss, Kelp, Nutmeg, 24 Karat ChocolateTM Powder(don't confuse this with regular chocolate, its far from it), Ginger, Orange, Mexican Sweet Lime, Morinda Citrifolia (Noni Juice), Mangosteen, Citric Acid, and Rosemary Anti-Oxidant. Sounds good doesn't it? Well...there is a better way. UMAC-Core also makes and sells the pure marine phytoplankton without all the added dilution of the juice! This product is not offered to their distributors and I bet they don't know about it either. And personally, Tom Harper took the pure stuff so if I was going to take this I would want the pure stuff as well, wouldn't you? I found pure Marine Phytoplankton over on Amazon in a tablet form or tincture with added sea minerals. Frequensea is there as well but I would get the pure stuff if I was you. Besides, it is cheaper in the long run. As always, please feel free to contact me with any questions about marine phytoplankton or yeast infections in general.